SUNNYVALE, Calif.--(BUSINESS WIRE)--Embolx, Inc., a medical device company developing microcatheters for arterial embolization procedures, today announced CE Certifications for its next-generation family of Sniper® Balloon Occlusion Microcatheters for the treatment of cancerous tumors, enlarged prostate and uterine fibroids. The novel system of microcatheters, which deliver pressure-directed arterial embolization therapy, is now commercially available in both the United States and Europe. Sniper microcatheters increase therapeutic agent delivery to target areas, while protecting surrounding healthy tissues, by controlling pressure to alter blood flow. Embolx’s next-generation Sniper microcatheters are available in 110 cm, 130 cm and 150 cm lengths, enabling interventional radiologist physicians to access through femoral or radial arterial sites. Advancements in the Sniper balloon and atraumatic tip designs also allow larger vessels to be occluded and enhance the ability for Sniper to track inside vessels. The United Kingdom’s National Institute for Health and Care Excellence (NICE) recently issued support of prostate artery embolization (PAE) for the treatment of patients with benign prostatic hyperplasia. 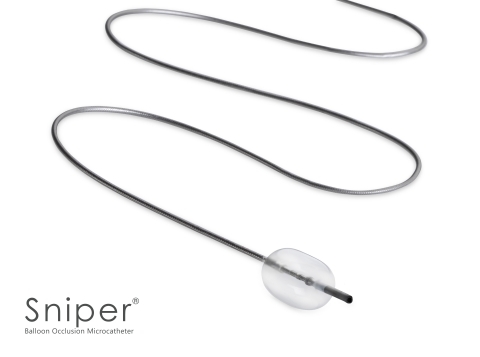 With its ability to eliminate reflux and redirect blood flow away from surrounding organs, Sniper has the potential to become the device of choice for PAE procedures. Based in Silicon Valley, Embolx is an emerging commercial-stage medical device company developing microcatheters for arterial embolization procedures. Embolx is committed to dramatically improving the treatment of a variety of conditions, including cancerous tumors, benign prostatic hyperplasia and uterine fibroids. The Sniper® Balloon Occlusion Microcatheter sets a new standard for precise embolic delivery and superior target filling by controlling pressure to direct blood flow while protecting non-target surrounding tissues. For more information, please visit www.embolx.com.